There's just something about candy corn! I love the vibrant colors. I love how it makes fall feel real. 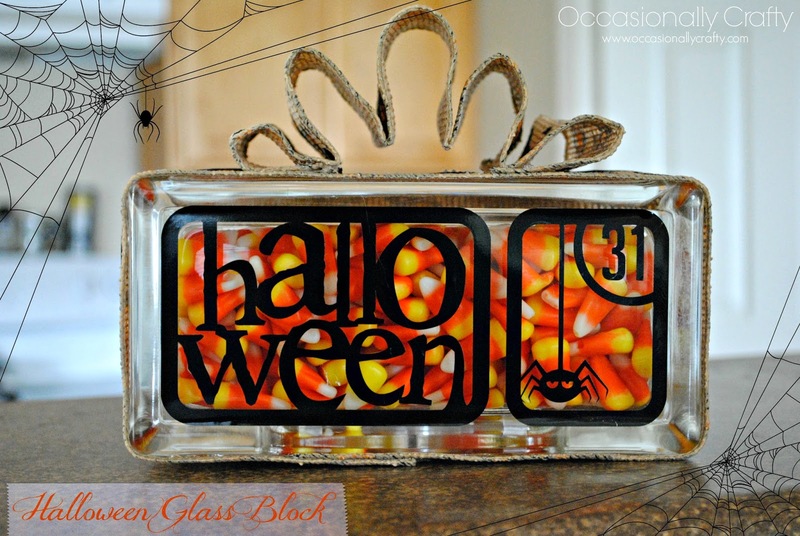 I love how it tastes, and I love decorations that have to do with candy corn! I just knew this had to be our starting material for our Halloween Sister's Challenge! 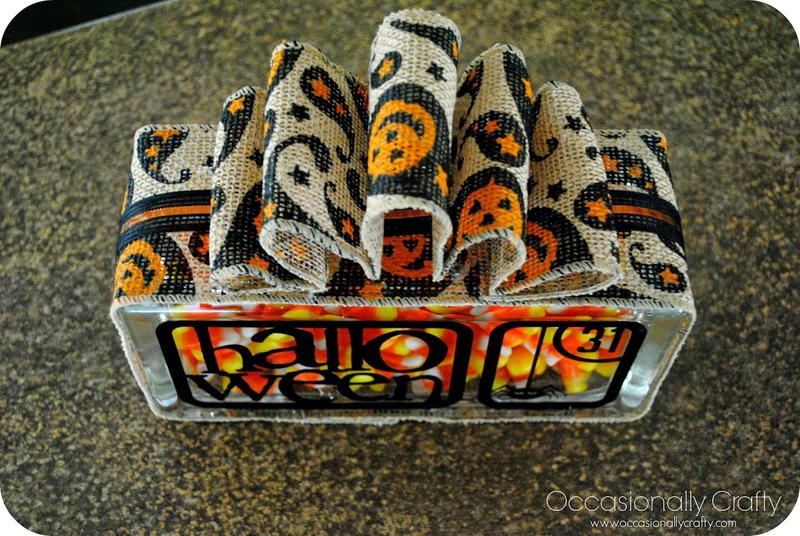 Yesterday Valerie showed us her super cute Candy Corn Shadowbox. I love how she used the candy corn as the ground and it looked like the trick-or-treaters were walking on it! It's so cute, so if you missed it you can click above to see it! 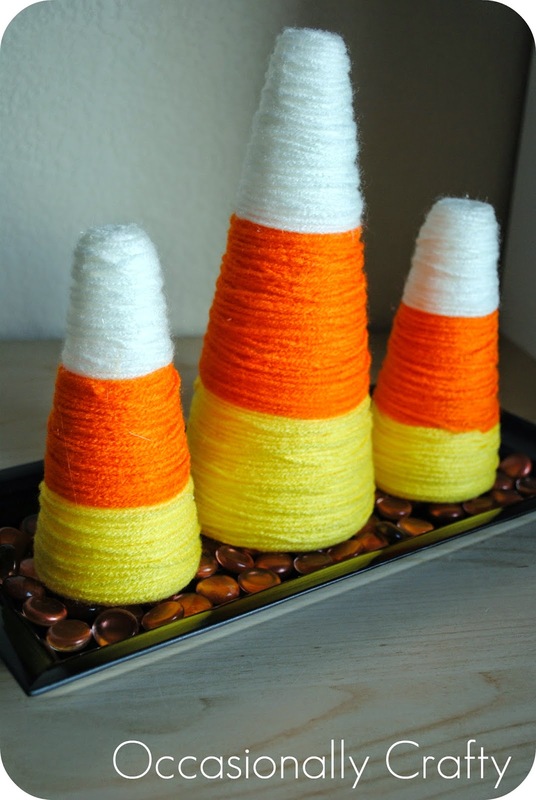 Last year I made these yarn wrapped candy corns, but this time around I wanted to use actual candy corn. It had been awhile since I'd crafted with vinyl or glass blocks so I quickly came up with this decoration! I got the vinyl image from the Silhouette Online Store and sized it to fit on my glass block. Then I filled the block with candy corn, added some fun ribbon, and now it's ready to be displayed along with the rest of my Halloween decorations! What should our next Sister's Challenge material be? Both of these crafts are cute and I think I could probably make both of them. Thanks Aimee! They were very simple but I get lots of comments from my piano students! This is so nice and original. You are giving me great ideas for decorations! Thanks Caroline! That's why we love sharing our creations, to help others create too! Very cute crafts. Hmm, for next challenge, how about using a cardboard shoebox? Just an idea :). Ooh! A cardboard shoebox sounds tricky. What do you think Valerie? I love how it's bright and positive :) lovely ! Thanks! Neither of us are into the gloomy parts of Halloween. There are so many fun and bright colors to play with. So cute! I love the image you used. I have yet to make anything with blocks, may need to change that! Definitely use a 40% coupon for them, and there are so many great ideas out there for all seasons! I have one for Christmas with a vinyl nativity on it. What wonderful ideas! Thank you for the inspiration! I love the way it turned out! I still haven't made time to do any Halloween decorating. I'm totally slacking!